The theme this fortnight is a child or children and to use a capsule, bottle cap with item or picture sealed in it. As you can see from my card I did not use a picture but instead chose items to symbolize childhood. 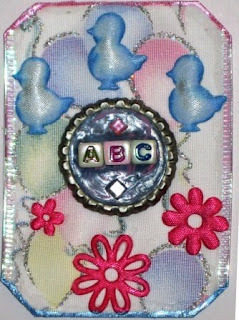 The ABC building blocks were encapsulated in the bottle cap using a swirled mixture of pastel pink and blue puffy paint. The background is a beautiful ribbon with balloons of various pastel colours printed on it. The little blue ducks, to symbolize boys, are cut from ribbon and edged with ink to make them stand out more and the pink flowers are to symbolize girls. The ribbon has a holographic edge at the sides and where I cut the ribbon tip and bottom to fit the playing card I have tinted the edge with Brilliance inks.